This Child Care Benefit Calculator aims to help Australian parents to estimate their Child Care Benefit (CCB) percentage and how much CCB and Child Care Rebate (CCR) they can get from Australian Government based on the Family Assistance Guide (Version 1.155 - Released 20 September 2012). 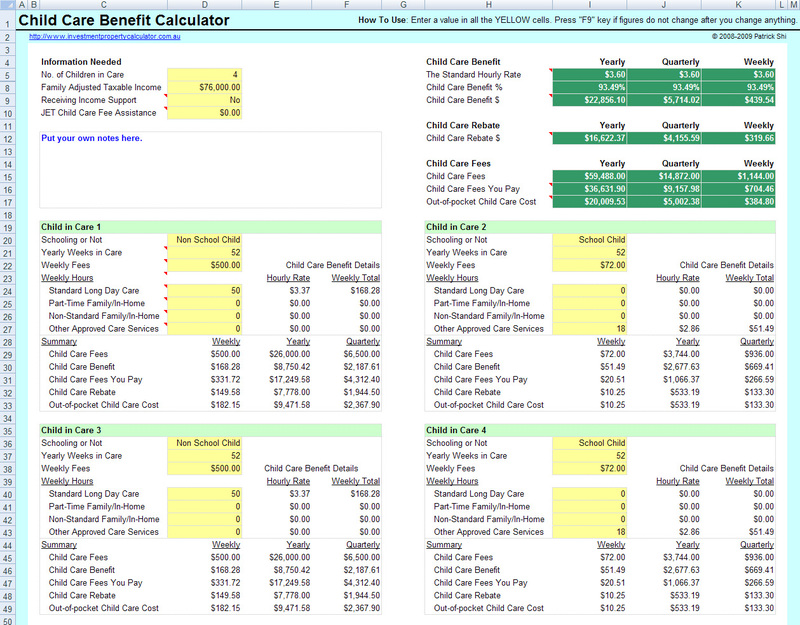 This Child Care Benefit Calculator estimates the Child Care Benefit Percentage (CCB %) based on no. of children in care (school or non-school children), the hours they are in long day care (LDC), and the family's adjusted taxable income (ATI). It shows the total annual Child Care Benefit (CCB), Child Care Rebate (CCR), and also works out the total child care fees that you actually pay after CCB and CCR. I believe this will help many Australian parents to understand their entitlement of CCB and CCR better so that they can manage their money better. The Australia Government does have an online CCB & CCR estimator which can be accessed from this link. However, I just don't think it is very user-friendly. You can always verify the results from my Child Care Benefit Calculator by using the online CCB calculator from Centrelink. This free Child Care Benefit Calculator can be used by families with different numbers of children. Below is a screen shot to estimate 4 children (two are school children, the other two are non school children) in care for an annual family income of $76,000. 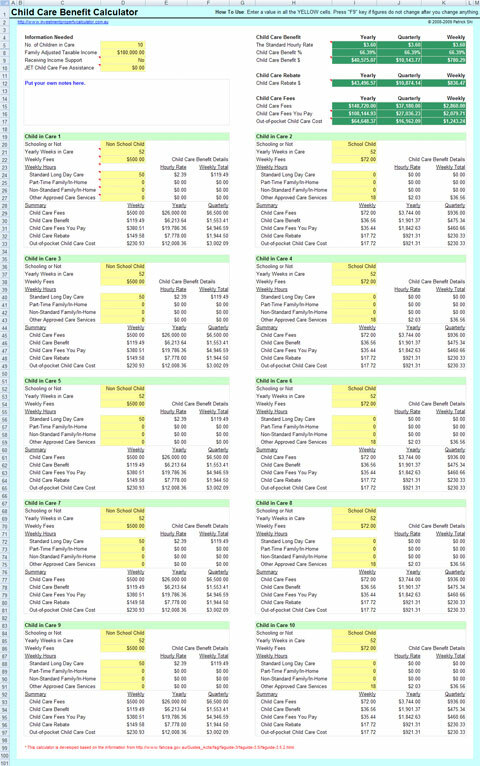 I hope this will give you a better idea that what you need to do and what this free Child Care Benefit calculator can tell you. 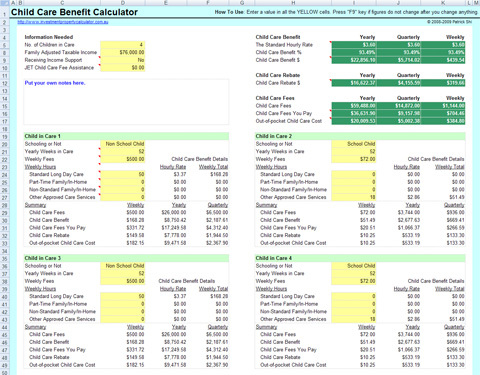 The Child Care Benefit Calculator can estimate up to 10 children in total. Though it is not difficult to add in more but I just don't think many of us have more children than that. ☺ Here is an example to estimate 10 children in care for an annual family income of $180,000. Taxable income percentage: it is a variable applied to a recipient's income in calculating their adjustment percentage. The taxable income percentage is affected by the number of children in care. Multiple child percentage: it is a loading applied in determining an applicant's CCB percentage. The loading reflects the increased cost when more than one child in a family receives care. The multiple child percentage applies if more than one child attends the same kind of care in the same week. Standard hourly rates: the CCB Standard hourly rate for approved care is $4.17 for FY2016. It takes effect on the first Monday of the income year. Eligible child care hours: it is the total number of hours in sessions of care that are provided to the child in the week concerned, and for which the applicant is eligible for CCB. It is usually limited to 24 or 50 hours for each child per week. Some families are eligible for more than 50 hours for each child per week. CCB percentage: this depends on a family’s adjusted taxable income and the number of children in care. It is determined by using the this formula (Multiple child percentage x Taxable income percentage). It can be a whole number or to two decimal places. Schooling percentage: it is a loading used when calculating the adjustment percentage and an applicant's CCB entitlement for registered care. The percentage applied is 85 per cent if the child is a school child and 100 per cent if the child is not a school child. If you would like to know more about the factors and formulas used in calculating the Child Care Benefit percentage and the payment, please visits the Family Assistance Guide Version 1.155 - Released 20 September 2012. Or you can go to the CCB Rate Calculation page directly. Parents might also want to check out the Free Child Care Salary Sacrifice Benefit Calculator and the Free Medicare Levy Surcharge vs Private Hospital Insurance Calculator. They should be useful for parents whose money is often tight.